Ta da! 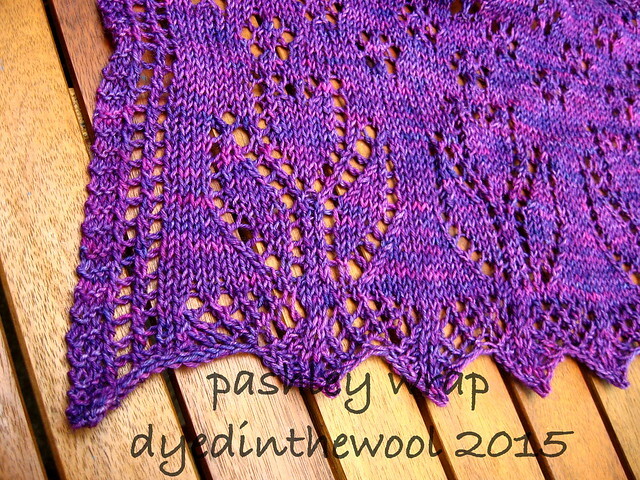 I have a pattern in the new, Best of British, issue of Knit Now (issue 44) and it’s the Pashley Wrap. Despite having hayfever I still love flowers. The solution? 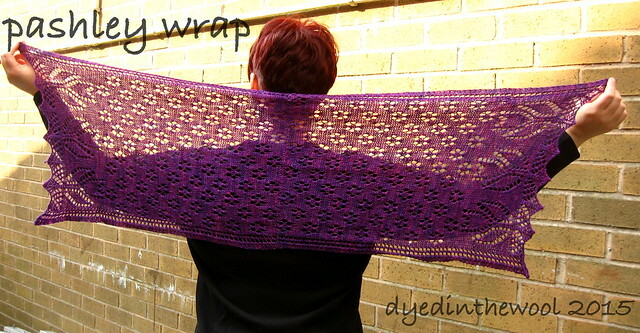 A knitted wrap strewn with blossom! This wrap is named for the Pashley Manor tulip festival held in East Sussex to commemorate the arrival of the first tulips into Europe in the 16th Century. I had fun designing this; making all the elements work together and flow into one another. I think it may be the most delicate and “ladylike” thing I’ve ever designed! 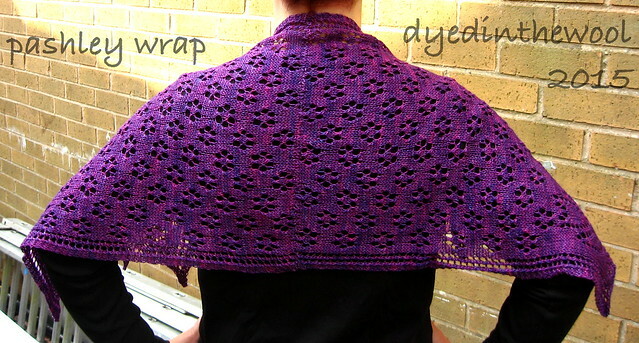 The yarn used for this project is Ripple Crafts Bluefaced Leicester 4-ply in A Dangerous Shade. 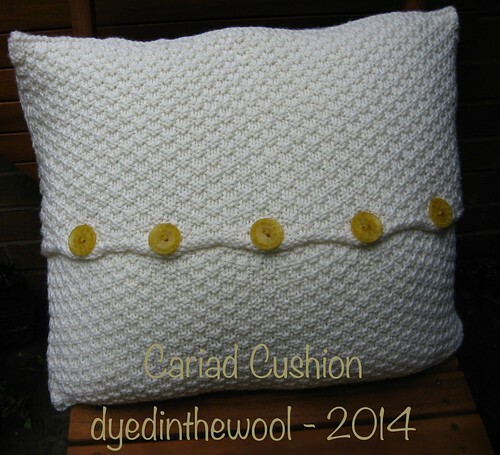 It was a lovely yarn to work with; very smooth and with a great drape. And I used pretty much every last centimetre of it! 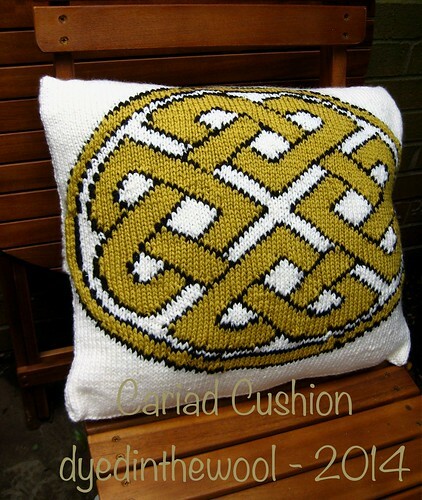 The pattern has charts and written directions, so there’s no excuse! 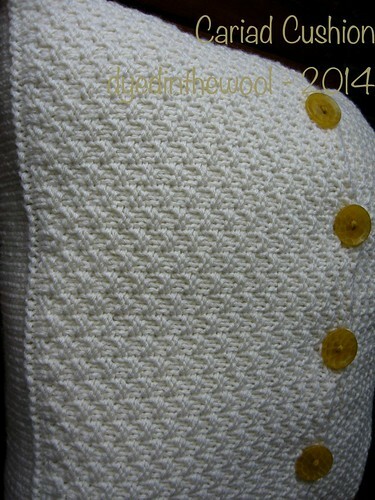 Kit details: Finlay Fox kit by Barbara Prime, free with issue 36 of Knit Now. Got the magazine on the 20th of June, cast on the next day and finished on the 23rd. And most of that was sewing and stuffing! 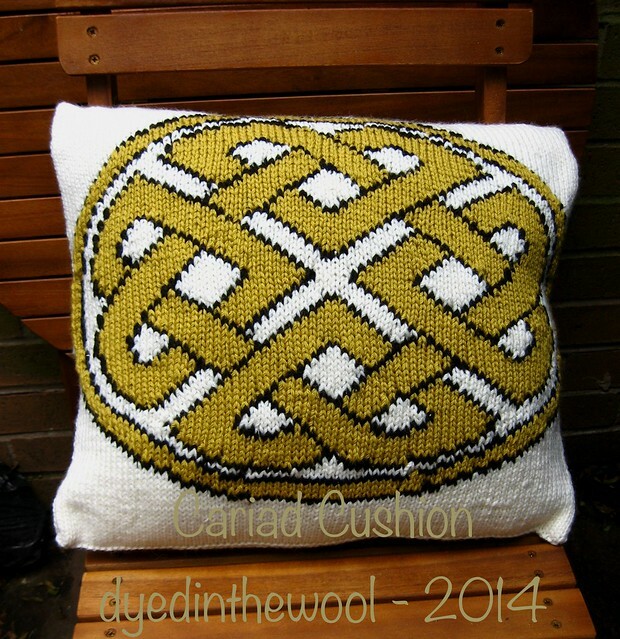 This was a quick knit for me but I only worked on it a bit each day due to bathroom and shed-related renovations. There are, shall we say, issues with the ears. Entirely my fault, but I sewed them on in the wrong place and they aren’t as perky as the designer intended. I embroidered all the facial features with DK-weight black yarn, as opposed to using safety eyes as suggested in the pattern. If I were to make this again I’d convert all pieces to knit in the round, except the ears. And off he goes to live next to my dad’s computer to keep his Firefox browser company! Going from buying the yarn to casting on was a scant (for me) 9 days! 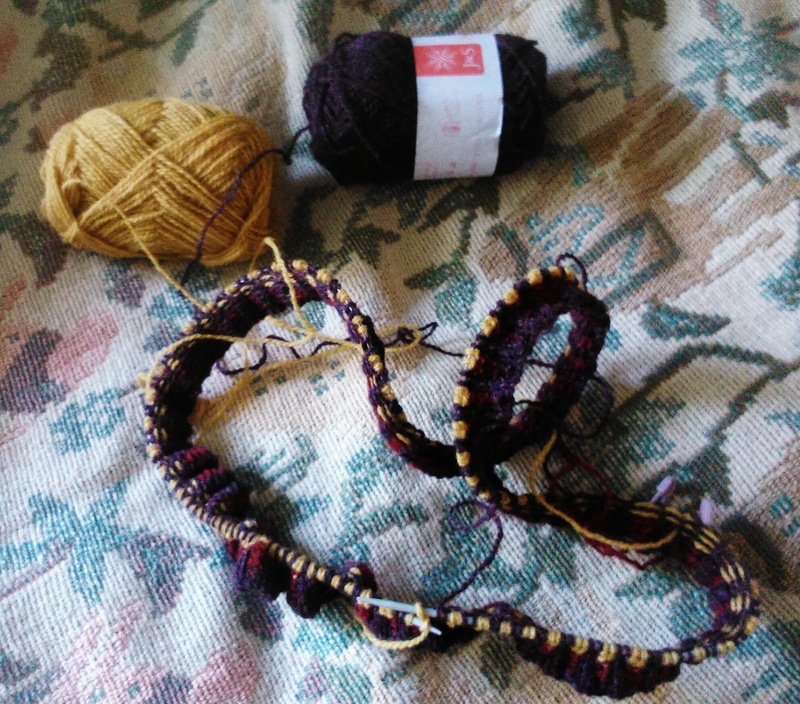 And most of that was swatching and purchasing a knitting needle! It looks like a snake! I do, however, have a new design in the pipeline so I suspect that the Chrysanth Vest progress will take a nose-dive soon! 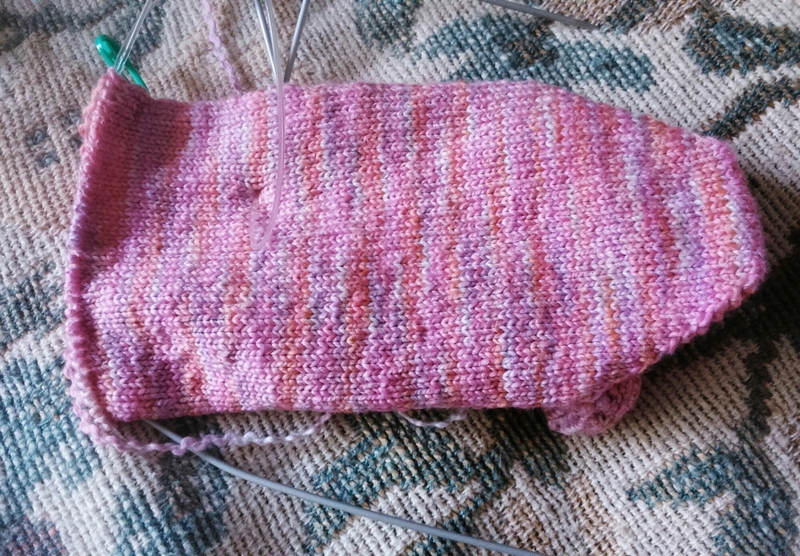 I’ve also just got the toe to finish on this sock, photograph the two pairs I’ve made, write up the pattern, get a second test knitter to try it out, tech edit and then publish the pattern. Oh, is that all?